Butterflies needn’t fret in these months of September and November… many plants are at the height of flower production. Prominent among these is Aster novae-angliae. O. E. Jennings (1953) describes this beautiful, native aster as at its best in some moist, weedy tangle, often forming clumps along an old fence or woods border. This plant sparkled in Raccoon Creek State Park in southwestern Pennsylvania. 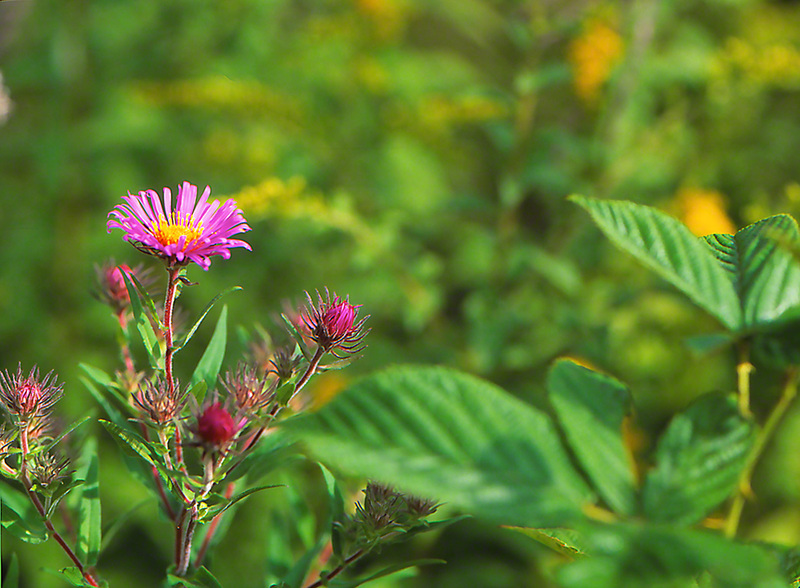 Our experience is that butterflies do not seek New England Aster as #1 on their preferred list, rather they resource these beckoning flowers as a backup source of nutrition. You wonder if these sweet pretties aren’t also present in Fall habitat to provide hikers and strollers a premium of lovely bloom, amidst otherwise expansive palettes of ongoing green? In 1979 the National Audubon Society‘s North American Wildflowers – Eastern Region ( Thieret, et al ) set its range throughout the eastern U.S., south to Georgia, north to North Dakota and west to Oklahoma, and parts of western united States. Let us know if that range has expanded since? I love Asters! I saw some blooming at the botanical gardens a few days ago. Their vibrant color was striking and normally, I see butterflies swarming, but none this time. Maybe it was just the time of day or something. I hope to go back soon. I think the New England Aster might be my favorite bloom this time of year. Thanks for sharing your expertise. I always learn something when I stop by and your photos are wonderfully real! Jeff – Chief dog walker of Shnookie (Shih tzu) & Munchkin (Shih tzu) & Petra (Black Russian). I never learned much about cameras before the digital age, and I still have much to learn. I love seeing nature up close and personal, but there’s nothing like the real thing! I bet working with film/slide is interesting! Sounds like you have a great time Jeff, as well as your three pups! My dog, Ruthie, is a Royal Egyptian Beetlehound (a title she earned with her exotic eyes and one that I made up). She’s having a hard time with her GI tract. She was hospitalized, got better, then yesterday I added her regular food to the prescription food, and the poor girl is sick again. I guess I am Chief Nurse for now. Hoping so much she is well again soon! They are the best buddies in the world.